Apple is borrowing some ideas from the competition with the second-generation Apple Pencil with a flat edge. The most exciting thing is that you won’t lose it in your backpack anymore as it uses magnets just like your smart cover. You can attach it to the tablet and it won’t get in the way if you’re using it in landscape. Even better, you no longer need to remove a cap to plug it to the Lightning port. The Apple Pencil charges when it’s attached to the iPad. It works pretty much like a regular wireless charger. When you first attach it to your iPad, it automatically pairs with the iPad. Finally, Apple added a gesture on the Pencil so that you can change the color or the shape of your strokes. You just need to tap twice with your finger. 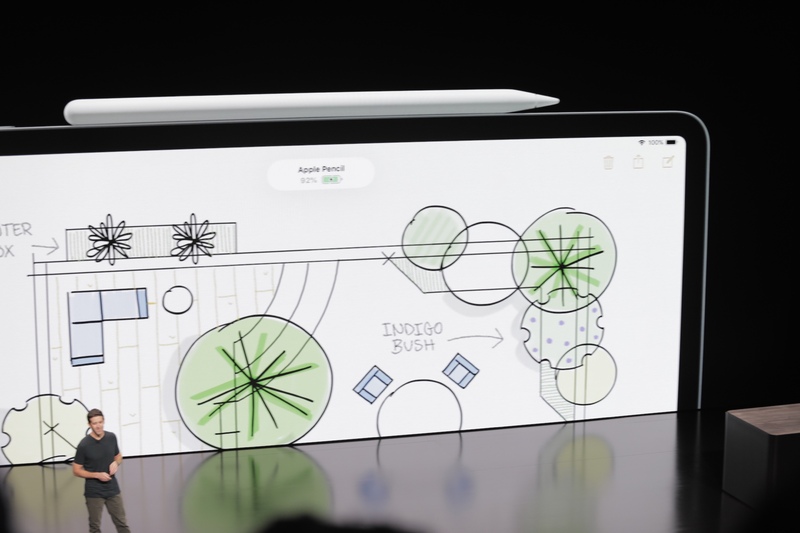 Tapping the screen with the Pencil lets you wake up the iPad as well. The new Pencil seems to work only with the new iPad Pro given that it requires magnetic edges. It will be available for $129. The new Smart Keyboard Folio will cost $179 for the 11-inch iPad Pro and $199 for the 12.9-inch iPad Pro.